The cold means a lot more work too (breaking ice out of water dishes alone adds hours). But there are positives, at least when it comes to hackle. Feathers are an excellent source of insulation. When our hands are cold you can hold a bird with your fingers underneath their feathers and almost instantly warm your hands. (There are some backyard chicken owners who don’t know any better and feel that they need to wrap their birds in sweaters. In reality, they may actually be doing their birds a disservice.) 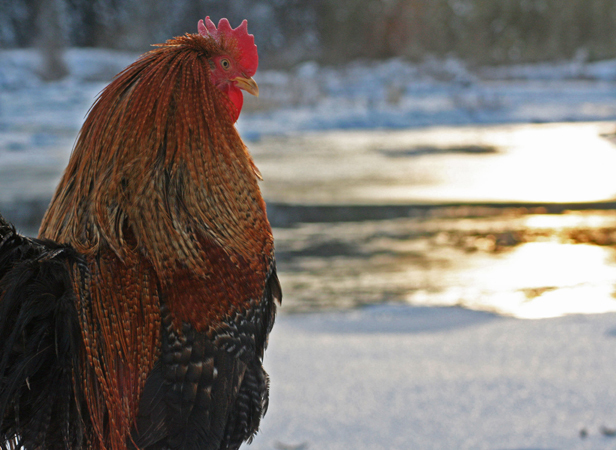 If chickens are under shelter – out of wind and rain/snow – they are quite hardy. Our feather cockerels are in such a building, with no additional heat source. I’ll go outside at first light and hear the roosters crowing just as loudly as they do in the summer. So as I bundle up to face the cold these next few days, I can take “warmth” knowing that the birds will be growing some fantastic hackle.